Jul 12, 2018 GBB (Gamma-Butyrobetaine Ethyl Ester): Super Carnitine That Makes You Sweat?! Aug 01, 2017 Eria Jarensis Extract / N-phenethyl dimethylamine: The Next Big Thing? If you are always feeling the jitters after taking a fat burner, you need to throw that away! Stop torturing your body like that when there are better fat burners out there! If you ever felt like that or had a queasy feeling, it was probably the ingredient Yohimbe. Get the magic of Olympus Labs with this intense fat burner! Introducing Olympus Labs Bloodshr3d! What is Bloodshr3d? This is the newest fat burner from Olympus Labs. Most fat burners contain the popular ingredient Yohimbe. Yohimbe is great but can sometimes cause side effects like jitters and even upset stomach. That's why Olympus Labs has made a great fat burning formula that gives you the same results with two brand new ingredients! One that gives you a great high octane fat loss and one that boosts mood! On top of that, Olympus Labs Bloodshred Black Magic contains caffeine to keep your focus on. How Does Olympus Labs Bloodshred Work? Why is this so special? 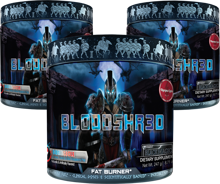 Because Bloodshr3d does not contain Yohimbe, a popular fat burning and mood boosting ingredient. Instead, Bloodshred Black Magic contains a list of ingredients that work together to give you the results you want! One of the first ingredients you get are BCAAs as Vegan Instaminos! These are very easy to break down aminos to help with recovery and increasing how long you can work out. On top of that, these aminos can help aid in preventing muscle loss while burning fat. Next, you have Acetyl L-Carnitine. This is the important and powerful ingredient that helps take the fatty storage in your body, and shuffles it to the mitocondrial to be burned as fuel for your body! Acetyl also helps with keeping mental focus. Taurine is one of the most important ingredients! Taurine helps to stabilize your muscle tissues! So what it does is to transport all these important minerals like magnesium through your body. Taurine can also rest the nervous system. KSM-66 is another ingredient in this formula. This is another form of ashwagandha extract. What this helps with is stress, lowering mental tiredness, and even increase your cognitive functions. Having all these benefits, ashwagandha may even help with weight loss. Caffeine is the big factor in this formula. There is around 300mg of caffeine in Bloodshr3d which is around 3 cups of coffee! Caffeine is know to help curb the appetite and give you intense energy. Caffeine can also boost your metabolism so that your body increases lipolysis! Green Coffee is basically coffee beans. The ingredient that we like from green coffee is chlorogenic acid, which can help with increasing metabolism and decreases fat absorption. 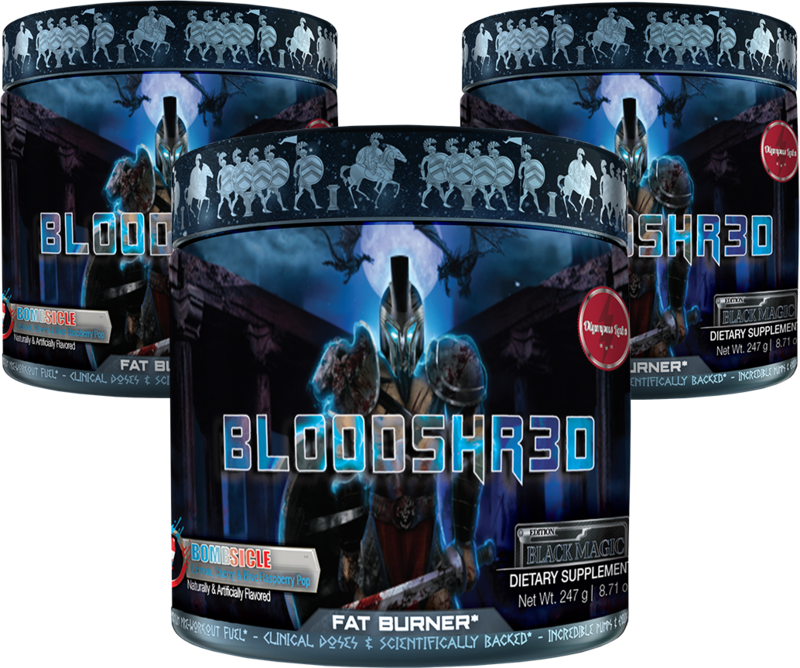 Pro-GBB is once of the special ingredients in Olympus Labs Bloodshr3d. This will increase carnitine levels which transport fatty cells to be used as fuel. How Do I Take Bloodshred? We recommend to take 1 scoop 30 minutes prior to workout with 8-12 oz of water. Once tolerance has been assessed, up to 2 scoops may be taken 30 minutes prior to workout with 8-12 oz of water. DO NOT EXCEED 2 SCOOPS IN ANY 24-HOUR PERIOD OF TIME. WARNING: NOT FOR USE BY INDIVIDUALS UNDER THE AGE OF 18 YEARS. DO NOT USE IF PREGNANT OR NURSING. Always consult a licensed practitioner prior to starting any diet and/or exercise program. Consult a physician or licensed qualified health care professional before using this product if you have, or have a family history of, heart disease, thyroid disease, diabetes, high blood pressure, depression or other psychiatric condition, glaucoma, difficulty in urinating, prostate enlargement, or seizure disorder, or if you are using a monoamine oxidase inhibitor (MAOI or any other drug or over-the-counter drug containing ephedrine, pseudoephedrine, or phenylpropanolamine (ingredients found in certain allergy, asthma, cough or cold, and weight control products). J Int Soc Sports Nutr. 2015; 12(Suppl 1): P57. J Cell Mol Med. 2018 Oct; 22(10): 4948–4962. Mol Metab. 2016 Jul; 5(7): 538–551. PLoS One. 2015; 10(3): e0120554.